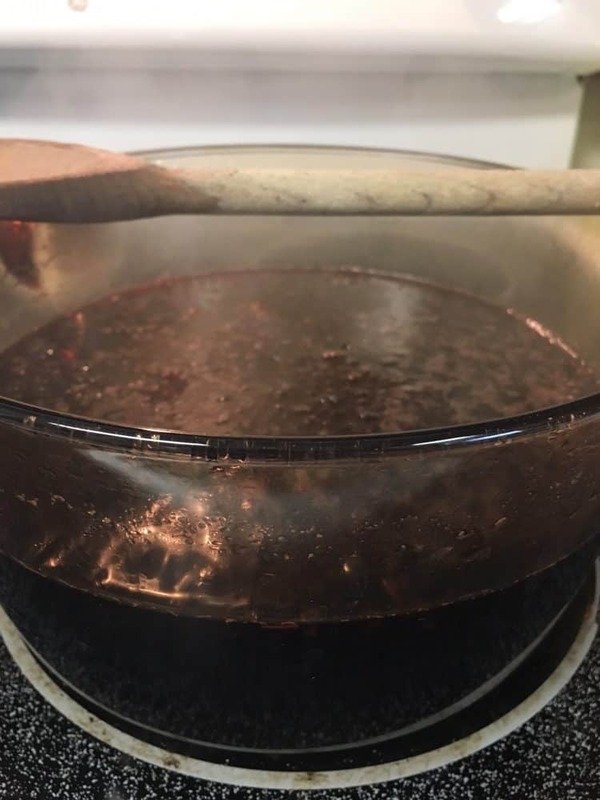 Have you ever wondered how to make elderberry syrup? In this post, discover the easiest and most delicious recipe with a step-by-step tutorial. 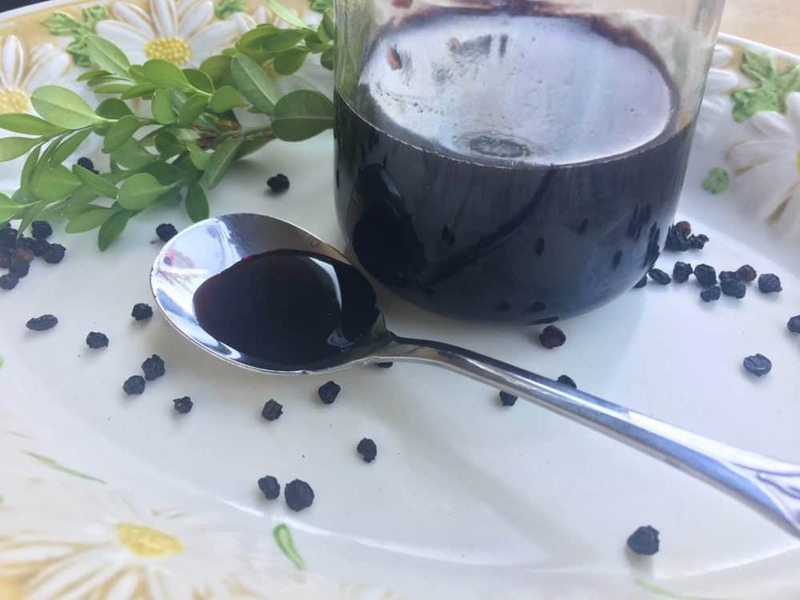 Elderberry syrup is in high demand during cold and flu season for it’s immune boosting qualities. To save money, making it yourself is the best option. 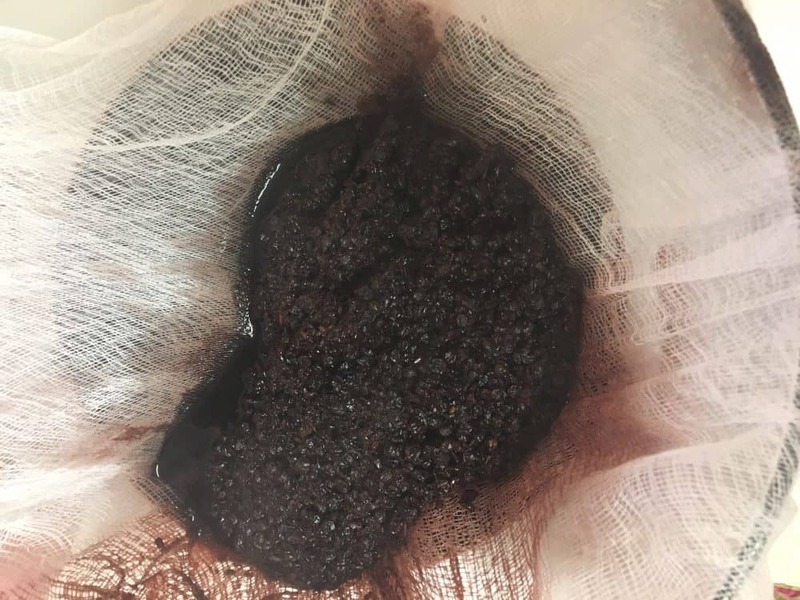 All you need is dried elderberries, water, honey, and a strainer to have fresh elderberry syrup for you and your family. It takes less than an hour, and most of the process is hands-off. Try this easy recipe to keep your family healthy this year. At the time, I had absolutely no idea what this was. But of course, we went on an elderberry syrup hunt and found a brand called Sambucol. We found the syrup for around $10 for a small bottle at the local drugstore. It seemed to help him get over his cough more quickly, but boy, we rationed that tiny bottle! I have to admit, I was a little skeptical of whether the elderberry syrup was actually shortening the cold, or if it was just a coincidence. So, I did a little research. Patients received 15 ml of elderberry or placebo syrup four times a day for 5 days, and recorded their symptoms using a visual analogue scale. Symptoms were relieved on average 4 days earlier and use of rescue medication was significantly less in those receiving elderberry extract compared with placebo. Elderberry extract seems to offer an efficient, safe and cost-effective treatment for influenza. So there is actual scientific evidence to support that this syrup actually works! And if it doesn’t completely eliminate symptoms, it at least shortens them. Of course, “an ounce of prevention is worth a pound of cure,” as the old adage goes. 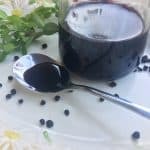 As I write this post, my husband and son both have a cold so I am taking the elderberry syrup along with them to prevent getting sick myself. It’s Easy. I had heard of people making elderberry syrup, but I thought it might be a complicated process so I never tried. That is, until my natural remedy-loving friend Tonya suggested we make some together. Having someone to work with made the process a lot more fun and less overwhelming. 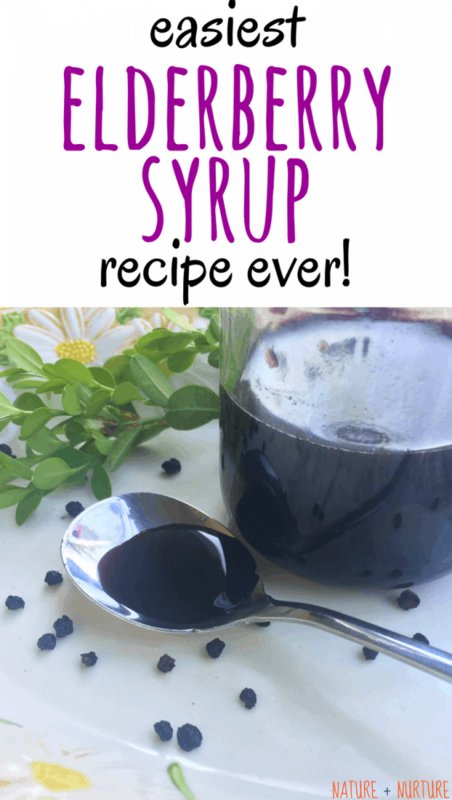 As I quickly discovered, the process of making elderberry syrup is actually extremely easy! 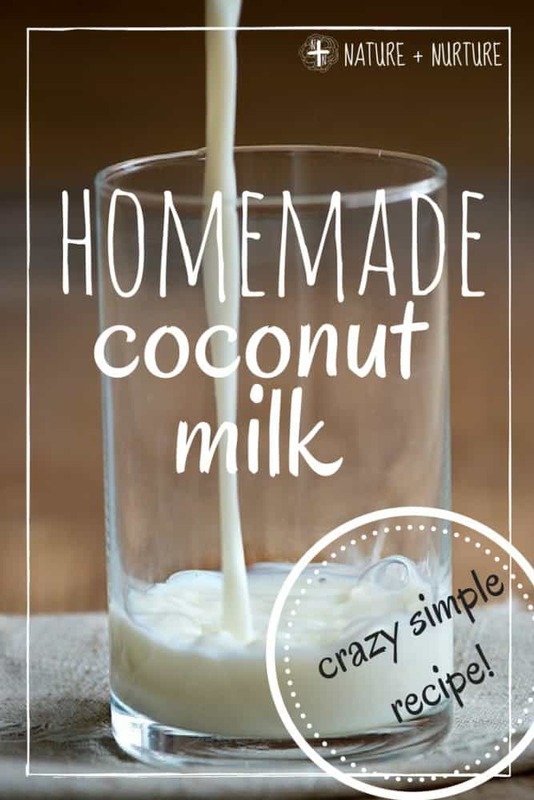 Anyone can make this simple and effective natural remedy. It’s Frugal. Taking elderberry syrup frequently is not really doable if you are using store bought. That stuff is pricey. But the savings of making your own is substantial! Sambucol is $10 for a 4 ounce bottle ($2.50 per ounce). 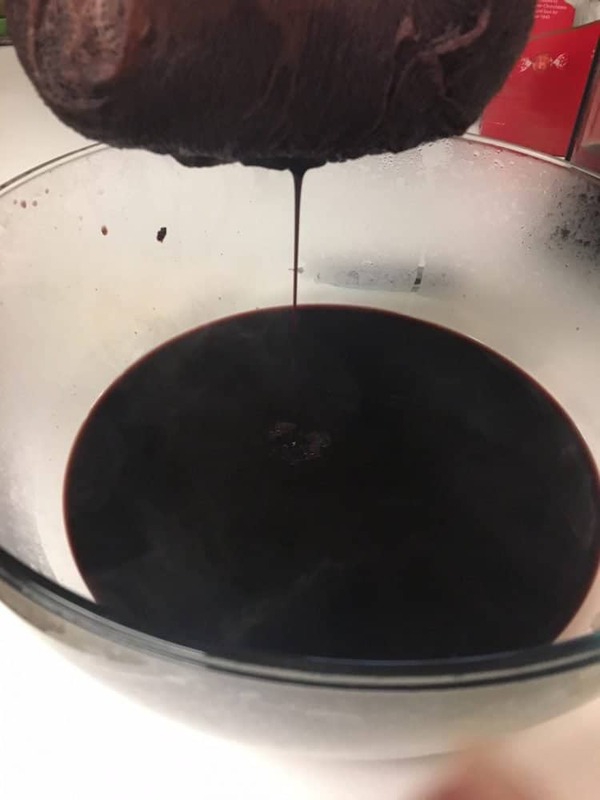 We made 32 ounces of homemade syrup for approximately $10 ($6 for dried elderberries, $4 for honey). The price per ounce is only $0.40! That’s a savings of 84%! It’s Delicious. This stuff is sooooo tasty y’all, and I’m not exaggerating. My 3 year old literally begs me for more syrup. It’s always nice when an effective natural remedy actually tastes good, too – it ensures you’ll actually follow through with the remedy. One word of caution before using elderberries: “Be sure to only use what is commonly called black elderberry (Sambucus nigra), as other members of the family can be toxic. Do not eat raw elderberries in any form” (according to Everyday Roots).” Good to know! Tonya, the friend I mentioned earlier, got this recipe from her mother-in-law who studied at the California School of Herbal Studies, completing the 8-month intensive Herbal Roots program of study at CSHS. I had to add a picture of the recipe in her handwriting, because I just think it’s cool. We actually doubled the recipe below and I’m glad we did – Tonya and I each got 4 small jars of syrup for our families. Sure, there are more complicated versions of elderberry syrup that include other additions like cinnamon and ginger. But I like the simplicity of this recipe. 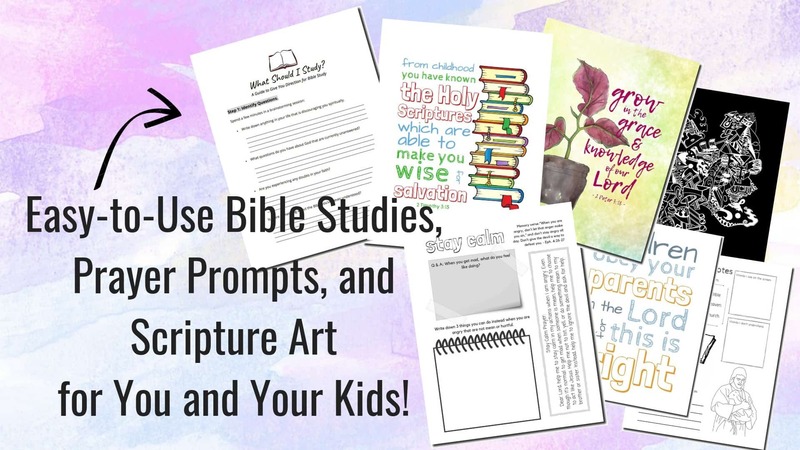 We all want quick, easy, and effective! Here’s how to make elderberry syrup, step-by-step. Add 6 cups of filtered water (we use this incredible water filter) and bring to a boil. Stir well. Reduce heat to medium low and allow to simmer for approximately 30 minutes. We actually stirred the mixture several times as it simmered (not sure if this did anything or not, ha!). After simmering the berries, we used a potato masher (like this) to get all the remaining juice out. Allow to cool, then strain through a cheesecloth into a large bowl. Squeeze the cheesecloth really well to make sure you get out all the elderberry goodness! Alternatively, you could use a mesh strainer. Next, add raw honey and stir well. The recipe actually calls for 2 cups, but we only used 1 1/4 cups and it was extremely sweet. Maybe the extra honey is there to thicken the mixture more – ours did turn out relatively thin. The thinness isn’t an issue, but I guess having it thicker would make spills less likely. Next time I might try using less water, more honey, or adding a natural thickening agent like arrowroot powder. If you try this, let me know in the comments. 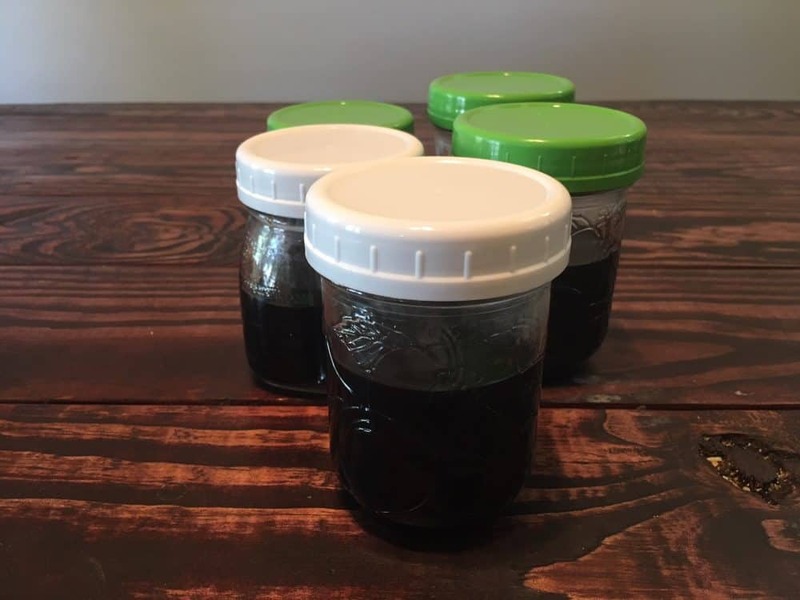 Finally, divide your elderberry syrup into small jars and enjoy! It keeps for several months in the fridge, and remaining jars can be stored in the freezer until ready to use. What’s the dosage information for elderberry syrup? For example, a great way to incorporate this into daily life would be to take one teaspoon per day during cold and flu season. If you start noticing symptoms, triple the dose. Use a smaller dose for kids and a larger dose for adults. 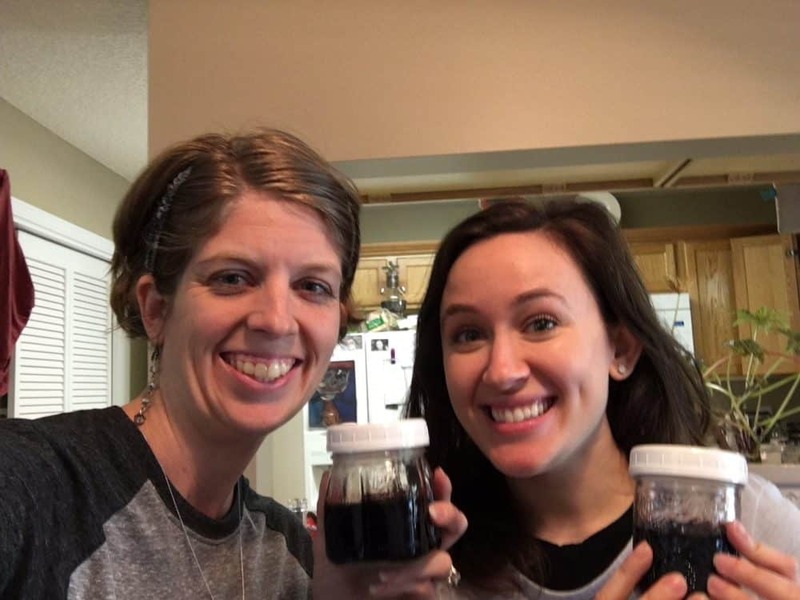 How long does elderberry syrup stay fresh? It keeps for several months in the fridge, and remaining jars can be stored in the freezer until ready to use. It can be kept frozen for up to 6 months. 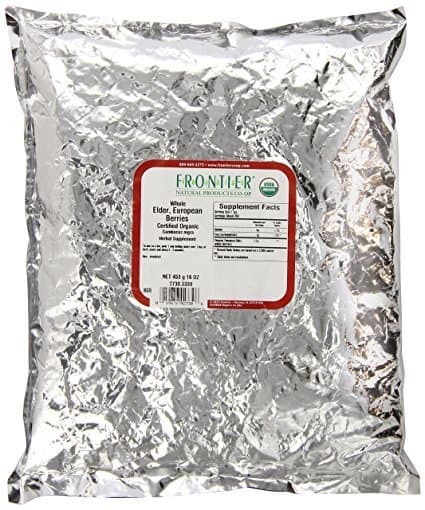 How long do dried elderberries last? Dried elderberries keep in the pantry for up to one year. If you have excess elderberries you won’t use in the current season, make extra syrup and sell it! Lots of people are willing to buy this, especially during flu season. 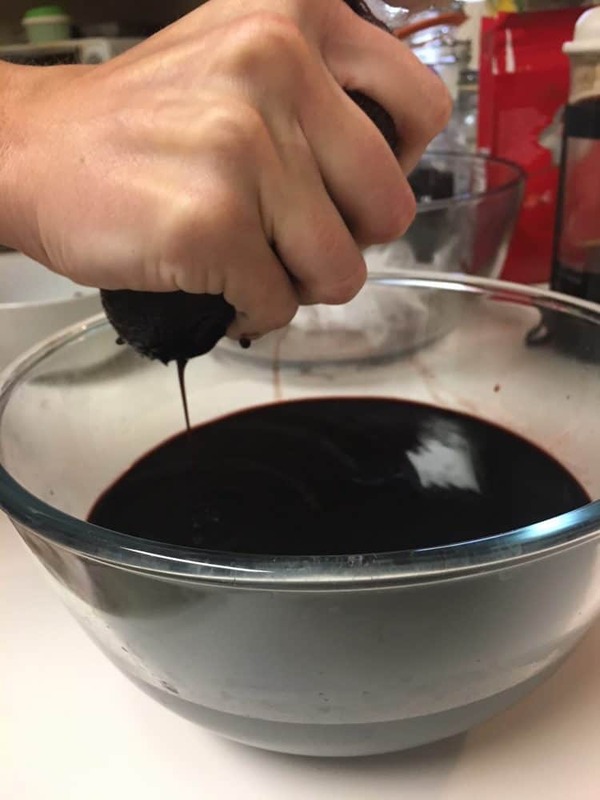 Sambucol and dried elderberries sometimes get sold out during peak season, so if you are making it yourself, you can help your friends and get a little extra cash. Combine dried elderberries and water in a medium sized pot. Bring to a boil and stir; reduce heat to medium low and simmer for 30 minutes, stirring occasionally. Allow to cool. Using a potato masher, mash berries well. Strain through a mesh strainer or cheesecloth into a large bowl. Add honey and stir well. Divide into small jars and freeze or refrigerate. Keeps 2 months in the fridge, up to a year in the freezer. Dosage: For prevention, 1 teaspoon 1 or 2 times daily. For illness, 1-3 teaspoons up to 4 times daily. Use a smaller dose for kids and a larger dose for adults. Honey should not be used for infants younger than 12 months of age. Tonya and I proudly displaying our new syrup stash. Now it’s your turn! Grab some dried elderberries and raw honey and make this yourself! It’s so quick and easy. Let me know how it goes for you in the comments, or if you have any tips to add. 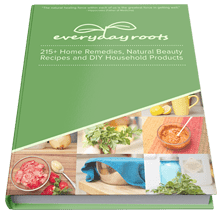 If you enjoy home remedies like this, here’s my favorite resource for them: The Everyday Roots Book. It’s over 400 pages of remedies for most minor ailments, plus DIY home & beauty products. 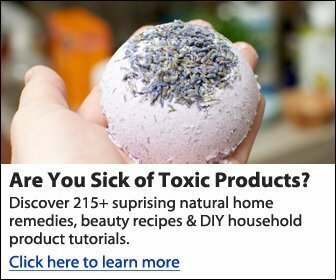 I’ve never seen a resource this comprehensive for DIY recipes and remedies, and believe me, I’ve looked. The author, Claire, runs a really successful remedies website and is considered one of the top experts. 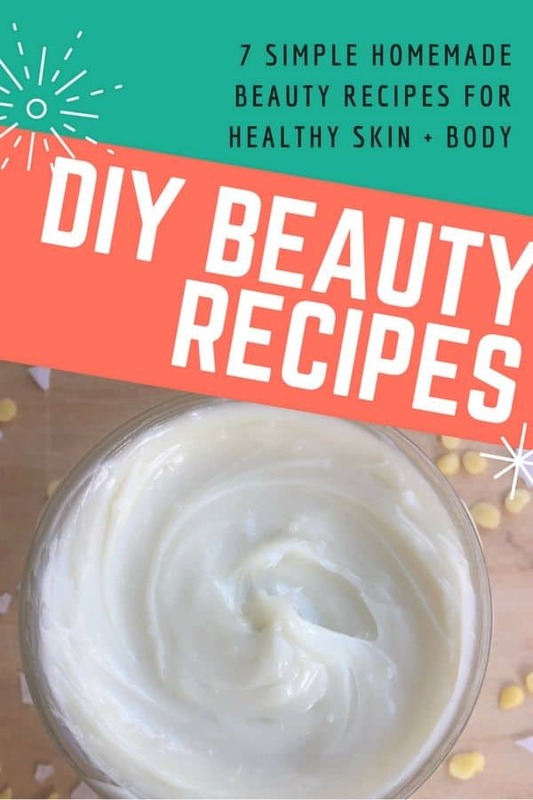 I love having this book on hand whenever I need a quick remedy, and I can’t wait to try some of the salves and lotion recipes. 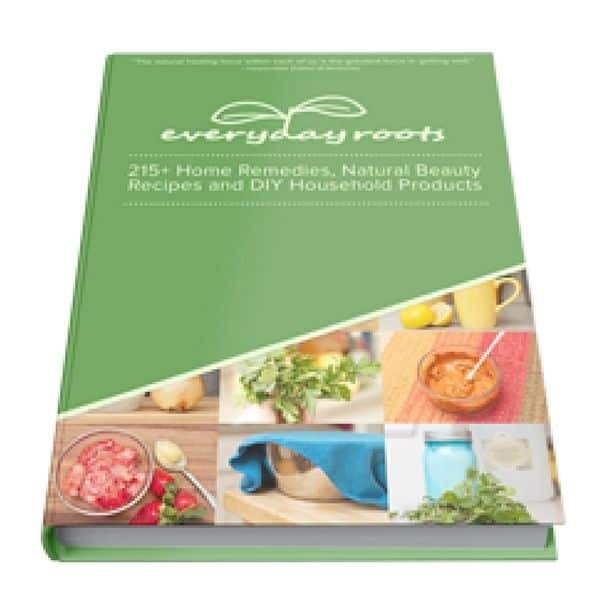 Check out the Everyday Roots book here! Is there a recipe that doesn’t need refrigeration? Not to my knowledge. Since it doesn’t have any preservatives, I would refrigerate. You might be able to find a different recipe to leave on the shelf on Pinterest or something. 🙂 (Sorry for the delayed response. I had a glitch on my blog and it wasn’t displaying any comments).